Perfect to go along with your Thanksgiving cocktails! I love making handmade gifts for the holidays, and these bar nuts fit the bill perfectly: tasty, easy to throw together quickly, and gorgeous in a pretty jar or crinkly bag. Plus, they make your house smell hella good when they’re roasting! I made these for our Supper Club a few years back and they’ve been a favorite ever since; great with salads or alongside cocktails. Technically, they’re really not a ‘caramel,’ but the presence of sugar and butter together gives it that distinctive caramel-ly flavor. I fix up a few batches of these sweet-spicy-savory treats just before Thanksgiving and have ‘em on hand for football tailgating, hostess gifts, and impromptu cocktail parties through the New Year. For the mixologist in your life, snuggle a box of bar nuts alongside a great bottle of booze and some swanky mixers. Preheat oven to 350 degrees. Spread nuts evenly out on a large rimmed cookie sheet. To a very large mixing bowl, add all remaining ingredients except for the raw/turbinado sugar. Stir to combine well (it’s okay if the butter is a little lumpy, it will melt later). Toast nuts on the center rack of the oven until they are fragrant and golden brown, about 10 minutes. Immediately toss the nuts into the large bowl with the other ingredients and stir with a large spoon until evenly covered. Spread all of the nuts out in an even layer on the rimmed cookie sheet; sprinkle with turbinado or sanding sugar. After cooling for about 15 minutes, taste, and adjust with a little salt or spice to your liking. Serve immediately, or store in an airtight container for one month. 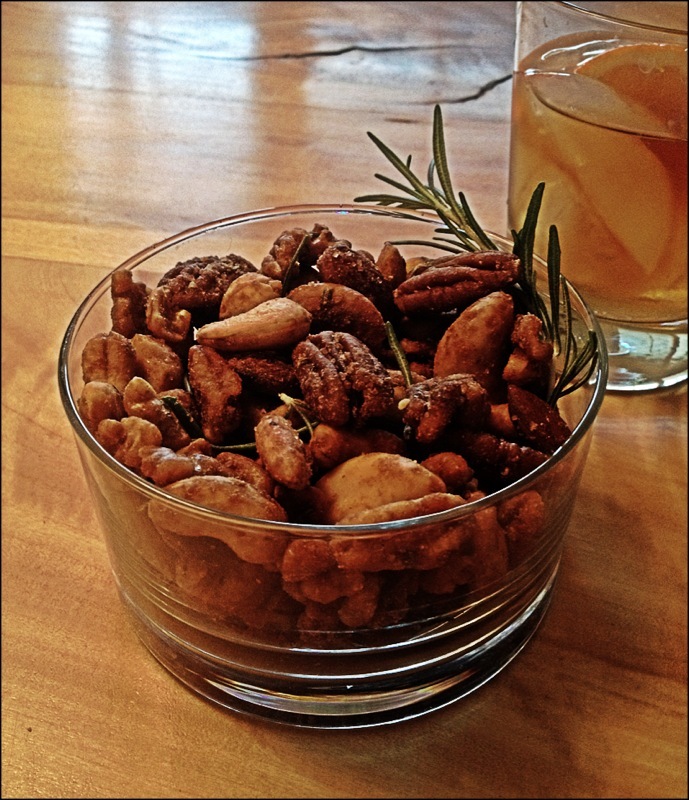 I recently served these nuts for a photo shoot on a piece I wrote for CityHomeCOLLECTIVE about Hot Toddies. Check it out! We’ve got snow! Time to pull in all the harvest, my friends, if you haven’t already. 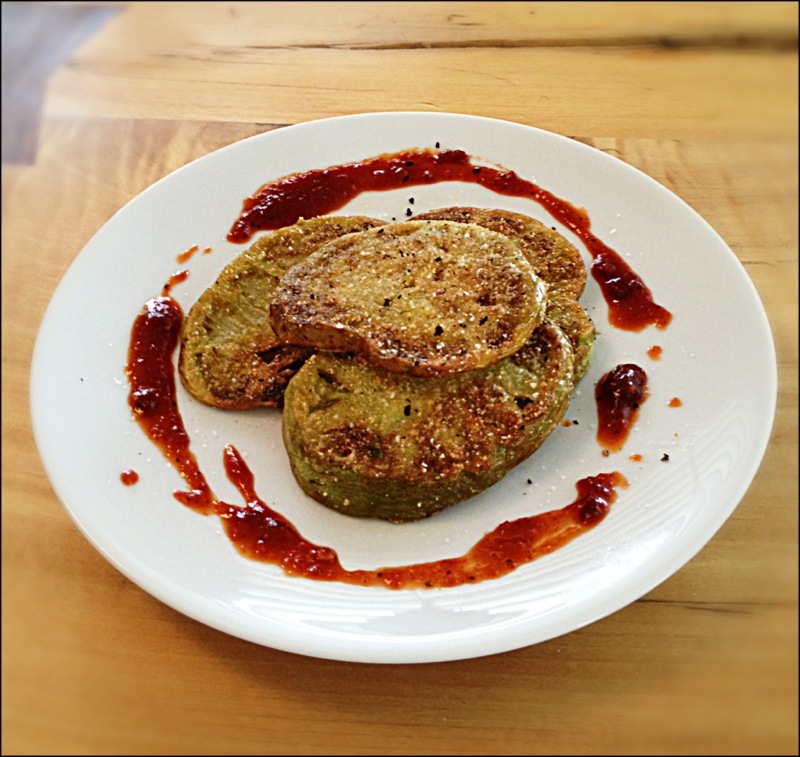 We’re eating green tomatoes for days here. My friend White Lightin’ Lemonade FB messaged me recently, “I would love to have your green tomato salsa recipe if you’re willing to share.” Sure! I’m going to do that, and more for this week’s H.O.A.G.Y (Help Out a Gal/Guy, Yeah?) We’re having them fried, pickled, AND in salsa verde. Use only entirely un-ripe firm green tomatoes for this dish. Some of my friends prefer a buttermilk/egg coating to the tomatoes before the dredge, but I like the crisp crunch of very lightly battered tomatoes. 4-5 large green tomatoes, sliced crosswise in ¼” thick rounds (discard both ends). Combine flour, cornmeal, and spices in a shallow bowl. Coat tomatoes entirely in flour dredge, tapping lightly to remove excess dredge. Fry in a cast iron skillet coated with a scant 1/8” deep hot vegetable oil or bacon grease, over medium-high heat. Reduce heat to medium if your oil starts to smoke and burn the tomatoes. Fry tomatoes until golden brown on each side, and just slightly softened through (about 7-10 minutes per side). Remove to a plate covered with paper towels to drain; sprinkle hot tomatoes with a little kosher salt. Add more oil or fat to skillet as needed. I like mine served with a little hot/sweet chili sauce. Spicy Pickled Cherry Tomatoes – ready for brine and the canner! Prepare brine: combine vinegar, water, and salt in a saucepan. Bring to boil, reduce to simmer. Prepare canner, and heat jars. Sterilize lids and rings. Pack hot jars to within ½” of rim with tomatoes. To each 8 oz. jar (halve for 4 oz. 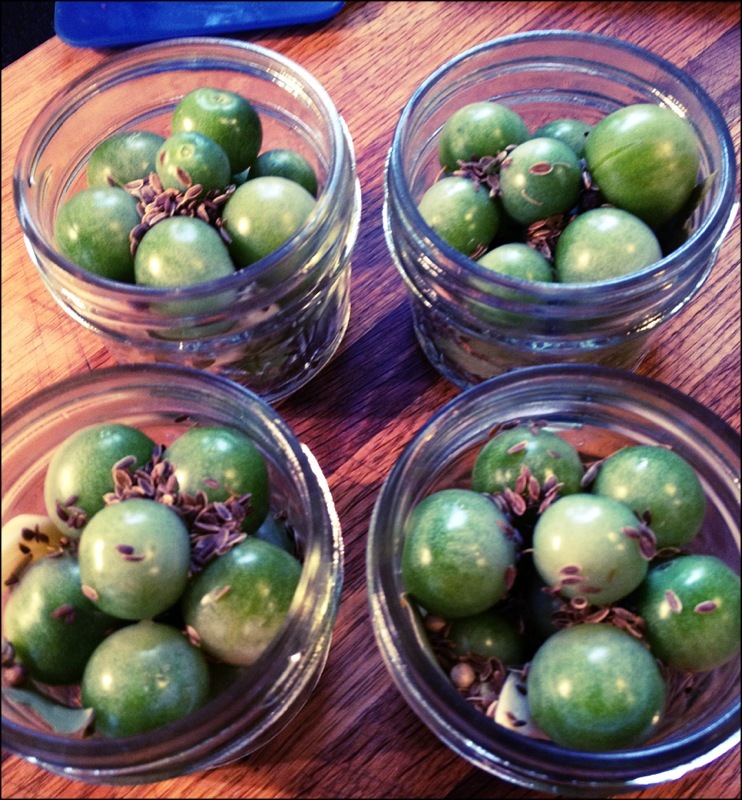 jars), add: 1 small clove garlic, ½ bay leaf, 10 black or mixed peppercorns, ½ tsp. dill seeds. 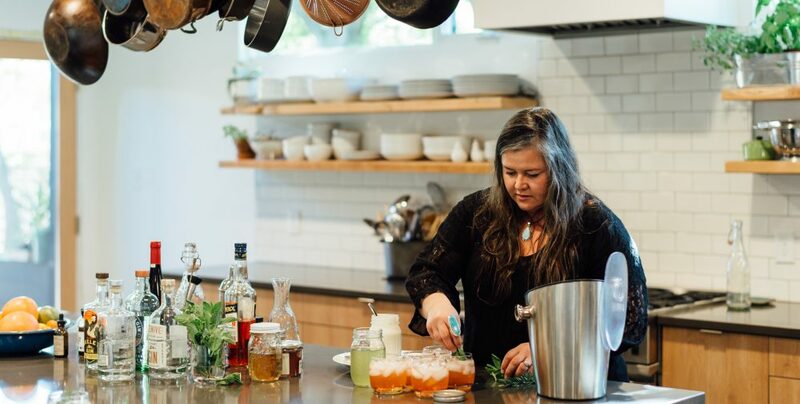 Ladle hot brine into jars, completely covering tomatoes, leaving ½” head space. Remove air bubbles and adjust for headspace with more brine if needed. Wipe jar rims, place lids and rings. Tighten to fingertip tight. Process completely covered with boiling water in canner for 15 minutes (at sea level; adjust for altitude). Remove canner lid and turn off heat. Wait 5 minutes, then remove jars, cool to room temp, and store for up to 1 year. I volunteer at my kids’ school garden, and we had a TON of leftover green tomatoes this year. 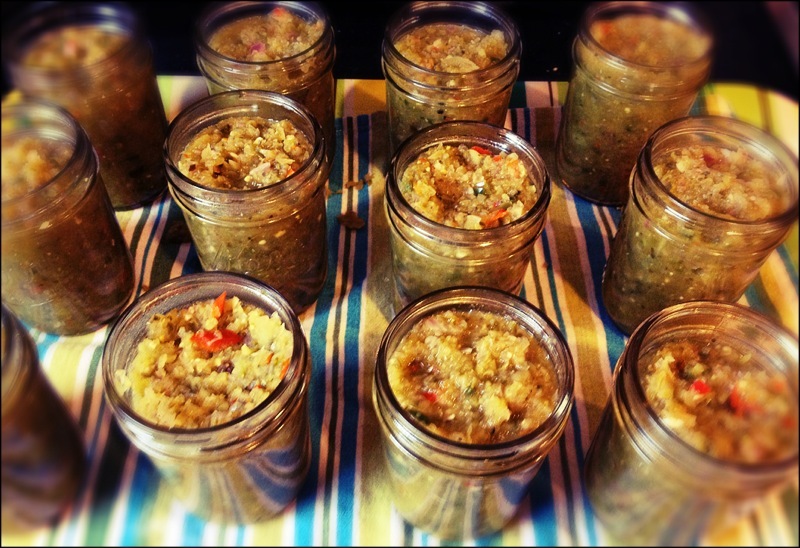 I made this salsa verde (usually made with tomatillos) with produce from the school garden and am planning to give it as thank you gifts for garden volunteers and teachers. It’s super tasty with tortilla chips, but I like it best with cheesy scrambled eggs and tortillas for brunch. Makes about 10 half-pint jars. 5-10 (about, to taste) chopped hot peppers; jalapeños, Serrano, whatever you’ve got! Prepare canner, sterilize jars, lids, etc. Combine all ingredients in a large non-reactive saucepan. Bring to a boil, reduce to just bubbling, and cook for five minutes, stirring constantly to avoid sticking. Remove from heat. Ladle hot salsa into hot jars. Leave ½” headspace; tap gently to remove air bubbles. Wipe rims, place lids and rims to fingertip tights. Process completely covered with boiling water in canner for 20 minutes (at sea level; adjust for altitude). Remove canner lid and turn off heat. Wait 5 minutes, then remove jars, cool to room temp, and store for up to 1 year.